Chess Edinburgh - Chandler Cornered - It's Nigel Short! Can Black take the Rook? See Ruxton - Coffey later on. and several former vicars and the bishop were in attendance. at the altar for a talk about the importance of the day. He began by asking them, "Does anyone know what a bishop does?" There was silence. But finally, one little boy answered gravely. "He's the one you move diagonally." In my Tribute to Tony Miles I stated I had found a 'bust' to an old trap. Black cannot play 6...cxb5 because of the smothered mate 7 Nd6. I expressed my glee at busting this with 6...d5 which wins a piece. Well time passed and enter Joel Adolph from Canada. 6...d5 7 e5! and White does not lose a piece (check it out). The move is 6...Ng6! which indeed does win a piece. (I'll correct my Miles piece at the same time as I post this). Cheers Joel. Glad to see someone is keeping an eye on me. My day out at Glasgow. 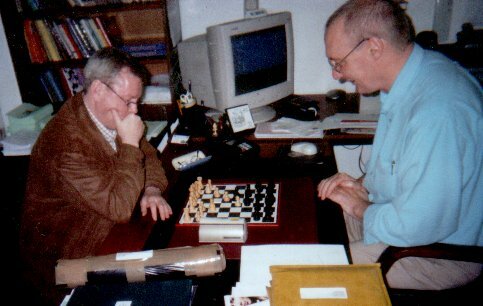 John Dempsey to give a lecture at the Glasgow Montrose Chess Club. John and Sam at 'work'. wined and dined me (2 pints of Guiness and a massive pizza). not unlike Sandy Bells. It has just as many characters. 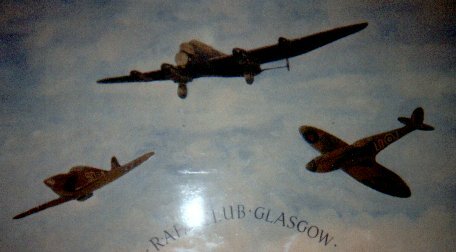 of a Lancaster, a Hurricane and a Spitfire. thrown in by me. Short games, traps etc. We discussed some interesting positions. Perkin v Woods (Black to play). Can you see White's threat? Now look again at the diagram. Yes Nb5 and the family fork on d6. Black missed this and play 22...Nxc5. White replied 23 Nb5 and the roof fell in. legal moves and waiting for his opponent to slip up. This is usually a good tactic by the stronger player. Leave them alone and they will make bad positional moves. create counter play with Nd6 and g4. The position is tricky. Instead white rolled the dice with 29 Bc4?!. However things get very interesting if Black plays 29...Bxc4. The following play is practically forced. 41.Kh2 Nd2 giving us this wonderful position with white to play. go 43 Kg2 when 43...Ne3+ picks up the other Rook. A nice piece of tactics that. tricks lay in the position. Black is certainly not losing. and what looks like a mistake cannot possibly be a mistake. test the stronger player's analysis. Here is the full game. Watch how quickly Black's game folds after 29...Bg4? She wafted into Bells with her Mona Lisa smile. She drank 80 shilling and a whisky chaser. 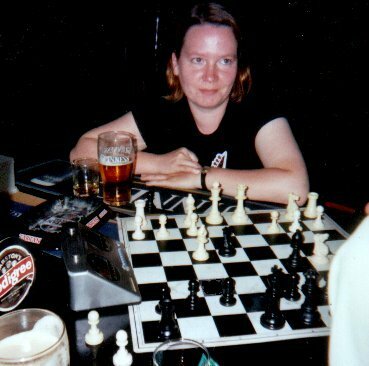 She hammered us all at 5 minute chess. Then she left, "...see you all later..."
Lothian's Allegro won by Douglas Bryson & Ian McNab. (Dougie won on tie break). Keith Ruxton - Patrick Coffey. On the same day as the Allegro, Hearts were playing Rangers at Tynecastle. in this position, Keith lit the fuse paper and we all watched the show. Black now played 10...Nd7. Why not take Rook? If he had then both players had this position in mind. 10...Nxa1 11 e5 Nd7 (11...Qb6!?) 12 e6 fxe6 13 fxe6. if the d7 Knight moves then Bb5+. Not pleasant. 10...Nd7 11 Bf4 a6 stopping Nb5 and Bb5. were looking at this possible continuation. things. Sometimes threats and tricks that don't exist. Here Black can defend and win with 14...Ne5 (it just holds). But a very difficult defensive move to see 4 moves ago. a Knight or a Bishop lands on b5 so decided to prevent it. I've said it once and I'll say it a million times. It's easier to attack than defend. slack move brings the house crashing down. We are programmed to attack! diagrams with the heading "White to play and defend." So we are back here. more out of the position. So he played 12 e5!? Well that's what Keith will tell you. would be miserable for months. I would show the position to all the punters. I would drag in passers by to show them the game. I would publish the game world wide. attacking moves and Black defending as best he can. defend against but his attack does need a Black error. It came in this position. Black played 21...Rc8? (21...Qf5! and I cannot find a win). 21...Rc8? the Queen on Rook are on the same diagonal. White played 22 Nxf6 and 23 Be6. It was all over. to The Royal Oak. 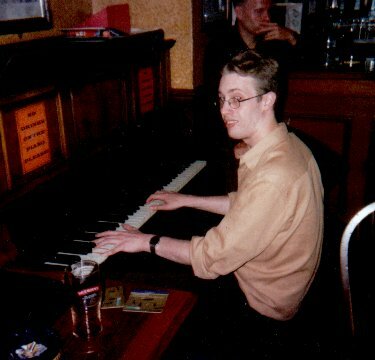 Look who plays the piano in The Royal Oak.